Valo othoba kharap somoi, suhker othoba dukher somoi, ghumer othoba jagar somoi, ordhek othoba full somoi, Valo thako sob somoi. Happy new year. boishakhir Saje SajBo Amra,SajaBo Rod,Sajabo Puro Sohor,Protibarer Moto Abaro Boron Kore Nibo Boishakhi Ke,Aktu Binno Alponate.Romnar Bot Mule Gaibo Gan,Bajbe Dhol,Bajbe Basi,Sobar Mukhe Aktai Sobdo Thakbe Malay Jaire.Nagor Dolar Misti Sure Jurabe Sobar Pran.Pohela Boishakhir Shubasca Janabe Ake Opor Ke. Akti notun shokal...kichu sundhor shopno, Ak mutu sada megh kichu bristy onuvuti r kichu shopnil sristy. Ai niye suru huk agamir din. Happy new year. Jora Patar Moto Jore Jacce&quot;3&quot;, To Ki Hoyacha? Baki&quot;201&quot;to Thik Ace, R&quot;3&quot;Jore LovesmsBD.com Giya Notun Pata Astece&quot;4&quot;&quot;2013&quot;k Biday Daw&quot;2018&quot;Sagotom janaw.Happy New Year. 2 Little bangla Month Sitting on a place. 1called Chaitra & 1 called Baishak. Going on Chaitra, Coming on Baishak. Good Bye chaitra and Welcome Baishak. Bondhu 2may Paina Khuje Ato Khujar Pore, Amay Mone Porle 2mi Dio Sms Kore. Panta Elish Vorta Vaji Bangalir Pran, Noboborshe Gaibo Sobai Boishakher Gan Eso He Boishakh Eso He >>Shuvo Noboborsho<<.!!! ..2ti Okkorer &quot;MA&quot; ato modur keno?<br /> &quot;6 Okkorer &quot;FRIEND&quot;ato kacer keno?<br /> &quot;4 Okkorer &quot;LOVE&quot;ato prio keno?<br /> &quot;6 Okkorer &quot;FLOWER&quot; ato sundor keno? But,<br /> &quot;5 Okkorer &quot;JIBON&quot;ato dukker keno.... Bolte paro ???? Noton bochor asok niya noton noton aasa Prithibite choriya dik sudue valobasa. Hana hani,Vedavad sob kichu voli Aso soba mila misa Sot potha choli. Sobaika New Year ar Soveccha. তোরাই আমার বন্ধু যে, তোরাই আমার ডিয়ার, তাইতো আমি ভালোবেসে বলছি শুভ নববর্ষ !. Good bye বলে শেষ করছি পুরোনো বছরের আশা, নতুন বছরের,নতুন সাজে জানাচ্ছি ভালোবাসা !! বসন্তের আগমনে কোকিলের সুর ! গ্রীস্মের আগমনে রোদেলা দুপুর ! বর্ষার আগমনে সাদা কাঁশফুল ! তাই তোমায় Wish করতে মন হল বেকুল ! 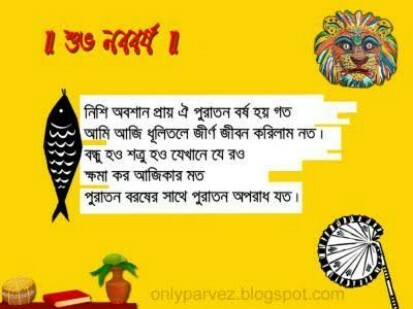 *"শুভ নববর্ষ"*.